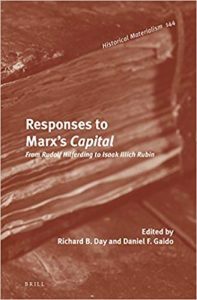 Responses to Marx’s Capital is the latest in a series of translations of classic Marxist writings by Richard Day and Daniel Guido. Their series has previously tackled imperialism and permanent revolution and now, in this edition, moves onto the extended reviews that greeted each volume of Capital on its publication, and critical assessments of value theory by classical Marxist writers, principally featuring Isaak Rubin. The freshness, erudition, insightfulness and culture, of these writings are astonishing. Hence the point of the translations no doubt, which are by turn, crystal clear, funny and rigorously researched. Richard Day introduces the collection with a discussion of the “Early Reception of Marx’s Economic Works” where he reviews the development of Marx’s political economy especially from the Contribution to a Critique of Political Economy onwards and this is followed by a philosophical essay that addresses the Hegelian foundations of Marx’s method, “Why Does Marx Matter?” In which Day explains how Marx resolves the outstanding questions of enlightenment philosophy. Each of the review articles opens with a short contextual piece written by the editors. Kaufman’s review of Capital I opens the collection. It is a curious experience reading the whole piece and not only Marx’s very familiar extracts. Kaufman, while so accurately summarising Marx’s method as a whole, criticised what he considered to be a contradiction between the realism of Marx’s method and the Hegelian language in which it is couched. The relationship between realism and method is debated through the collection. Otto Bauer’s fortieth anniversary celebration of Capital follows. Written at the height of the revisionist controversy, Bauer’s demonstrates a stylistic flourish as confident today as a hundred years ago. Kautsky’s brilliant summary of Capital II explains how logically and historically the circuit of money capital M-C-M’ (money – commodity – more money) developed out of the circuit of simple commodity production C-M-C (commodity – money – commodity). Kautsky further explains the significance of the distinction between fixed and circulating capital, surplus value and profit and turnover times. Sombart’s review of Capital III examines Marx’s solution to the transformation of values into prices. Marx showed that competition caused prices to systematically diverge from values through the transformation of values into prices of production. Marx noted “apart from the way in which the law of value governs prices and their movement, it is also apposite to view values of commodities not only as theoretically prior to the prices of production, but also as historically prior to them” (174). Which begs the question, if values existed prior to prices of production, then they also existed prior to the division of labour, whereas Marx’s solution to the transformation problem shows untransformed values being modified in response to a developed division of labour, which did not exist, historically and logically, at the point when values existed. The consequences of this contradiction have dogged Marx’s solution, even though the essential idea, that value is redistributed between different capitals to maximise, or equalise profits (in response to competition, so that prices systematically diverge from values) is simple and powerful. Marx provides the tools necessary for a solution even if the solution itself is incomplete. Sombart’s review, praised by Engels as “quite excellent” (163), also covers the division of surplus value into rent and interest and considers the nature of value in a developed capitalist economy. Cunow’s discusses Theories of Surplus Value I (TSV I) and provides some original and very pointed discussion of the contribution of Sir James Steuart to the labour theory of value and his relationship to mercantilism and the physiocrats and discusses Adam Smith’s confused distinction between productive and unproductive labour. Gustav Eckstein discusses TSV II which contrasts Ricardo’s labour value theory from Marx’s, particularly focussing on absolute and differential rent and crises. Rudolf Hilferding reviews TSV III the final volume of the collection in particular addressing the methodological assumptions that underpin Marx’s work through discussing Hegel and the ideas of Ernst Mach and the significance of Richard Jones for the development of the theory of historical materialism. Hilferding emphasises that “the actual development of capitalism corresponds to the logical development of the theory” (291). Economic categories are “historical” as “the contradictory character of social life made possible discovery of the development mechanism” (295) of capitalism itself. The reconciliation of the labour theory of value with differences in the organic composition of capital was “Marx’s most brilliant accomplishment” (299). Hilferding stresses the importance of economics as the foundation for a specifically Marxist understanding of historical economic categories, Richard Jones “arrived at his conception of history from economics and not from an indeterminate theory of environmental determinism” (322). Otto Bauer completes the first review articles part of the collection in providing an overview of the significance of the Theories of Surplus Value as a whole concluding that “the analysis of the capitalist mode of production turned into its criticism” (339). The second part includes further discussion of Marx’s method, the rise and fall of the German Historical School illustrated through Werner Sombart’s Modern Capitalism, and the development of the neo-classical, subjective alternative to Marx’s objective value theory. Heinrich Cunow, as part of the struggle against revisionist Marxism with its return to Kant, shows how Marx applied Hegel’s dialectic. Marx was “in a sense, an empiricist” he explains, but beneath the “everyday experience” of economic relations he sought to reveal “their essence, their often veiled character and the concept corresponding to it” (345). The task of science was to penetrate through outward appearances to “the inner nature of economic processes” (345). Economic laws are not natural laws akin to physics but “nothing but the laws of social relations between people” (349) and so “historically determined” (349). Hilferding discusses Wilhelm Liebknecht’s History of the Theory of Value in England and then discusses “Marx and the Problem of Theoretical Economics”. Rosa Luxemburg provides a critique of the idea of going back to Adam Smith. These shorter pieces are followed by Hilferding’s review of Sombart’s Modern Capitalism. Hilferding critique’s Sombart’s debt to Marx and where he differs from him, through Sombart’s rejection of the base-superstructure model. The outstanding piece of this section is however, Conrad Schmidt’s brilliant dissection of subjective economics “The Psychological Tendency in Recent Political Economy”. Written in 1892 Schmidt trounces the assumptions of marginalism in the shape of Menger, Böhm-Bawerk and Wieser. The “essential task of political economy” is “knowledge of these objectively understandable laws” (411). The riddle of economics, Schmidt explains, can “only be solved if we understand the universal, objective and comprehensive law that rules the exchange of commodities for money” (412). Money equates different goods with each other. Despite their differences “a common factor must exist that makes this equalisation, this commensurability of the seemingly incommensurable units, possible” (412). This common factor, and so the unit measured by money, can be nothing other than “labour per se” (412). In contrast the psychological tendency consider that as every exchange is always conditioned by the mutual consent and selfish interests of two contracting parties, then it is the subjective estimate of worth on behalf of each individual which determines “value”, so an objective law of value is impossible, money can be no unit to measure. In 1919 at the behest of David Riazanov, Rubin was employed to translate the works of Marx (as is explained in more detail in an excellent biographical essay). From 1920 he worked at the commissariat for education and became a leading historian of the history of economic thought. He was also a leading figure in the Bund, who stayed loyal to Menshevism throughout the 1920s. His admirable stubbornness did not go down well with the authorities. In and out of jail and exile through the 1920s he was not prevented from working and produced a series of brilliant articles on value theory. After the introduction of central planning in 1928 these relatively benign (in hindsight) conditions rapidly worsened. In December 1930 Rubin was re-arrested and then tortured with the objective of forcing him to denounce Riazanov. He was eventually murdered by the OGPU on the 27th November 1937. His unpublished works appear to have been destroyed alongside him. The three main articles in this section, “Marx’s Teaching on Production and Consumption”, “Essays on Marx’s Theory of Money (1926-28)” and “The Dialectical Development of Categories in Marx’s Economic System”, are between 90 and 110 pages apiece. They are supplemented with shorter articles on the Austrian School, Capital I and Ricardo. The recurring theme of these articles is that political economy examines social production relationships between people, not between things. Rubin’s article “The Fundamental Features of Marx’s Theory of Value” considers the relationship between Marx and Ricardo. This was a response to the critique of the marginalist school, who claimed that Smith was the forerunner for subjective use value and “Ricardo’s doctrine” was a “theory of costs of production but with no connection to labour value” (541). A view which was “fundamentally false” and which distorted “perspectives in the development of economic thought” (541). Marx’s theory of political economy is closely related to historical materialism and investigates “the change of production relations among people in accordance with development of productive resources” (543). Ricardo confused value with price, surplus value with profit, and labour with labour power. The divergence of value from price, does not abolish the labour theory of value but modifies it, but “since the magnitudes of production costs and of the average profits as well as their changes, are explained by changes in labour productivity and in the labour value of commodities, this means that the laws governing changes in the prices of production can only be understood by starting with the law of value” (579). Rubin’s discussion of the first chapter of Capital contrasts Marx’s understanding of value and exchange value in the Contribution and in Capital. In Rubin’s view in order to answer Bailey’s critique of Ricardo, that if value was represented by an infinite variety of different material products then there could be no common feature to all value, in Capital Marx distinguishes between the value of the commodity “representing a certain quantity of ‘materialised’ labour or labour time” the common feature shared by all commodities “and its exchange-value, i.e. value expressed in the use-value of another commodity” (589). Rubin’s “Essays on Marx’s Theory of Money” explores the relationship between Marx’s value theory in general and his monetary theory in particular. The process of exchange acquires a dual character, “the movement of material things from producers to consumers” and the movement of those same things “as carriers of the production relations between people” (644). Rubin’s discussion of “The Dialectical Development of the Categories in Marx’s Economic System (1929)” completes the collection. The subject matter of political economy is the “study of the production relations between people in a capitalist economy and the objective is to reveal all of the regular patterns involved in this sphere” (733). Production relations develop with changes to the productive forces and these are studied insofar as it is necessary “to explain the laws involved in changes of production relations between people” (734). The task of a “dialectical examination consists of demonstrating the necessary emergence of more complex forms of things from simpler ones. The investigator must reconstruct a picture of the development of production relations between people and of the corresponding social properties of things, moving from the simpler forms to the more complex” (772). The category of capital, “is a reflection of actual reality, since real phenomena, corresponding to the categories of a simple commodity economy, grew by way of along historical process into other real phenomena corresponding to the category of capital” (791). Responses to Marx spans an astonishing range of articles from many of the greatest Marxists to have written. Consistently brilliant throughout, the translations shine.